The Dryad Project is investigating programming models for writing parallel and distributed programs to scale from a small cluster to a large data-center. New! Dryad and DryadLINQ are now available in source form at the Dryad GitHub repository, with pre-built binaries available from NuGet.org. For release documentation see our Getting Started with DryadLINQ page. Most of the information below is historical and will be updated over time and migrated to the DryadLINQ documentation site. Dryad is an infrastructure which allows a programmer to use the resources of a computer cluster or a data center for running data-parallel programs. 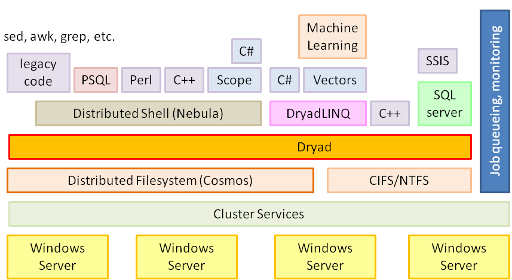 A Dryad programmer can use thousands of machines, each of them with multiple processors or cores, without knowing anything about concurrent programming. A Dryad programmer writes several sequential programs and connects them using one-way channels. The computation is structured as a directed graph: programs are graph vertices, while the channels are graph edges. A Dryad job is a graph generator which can synthesize any directed acyclic graph. These graphs can even change during execution, in response to important events in the computation. Dryad is quite expressive. 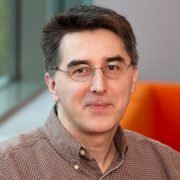 It completely subsumes other computation frameworks, such as Google’s map-reduce, or the relational algebra. Moreover, Dryad handles job creation and management, resource management, job monitoring and visualization, fault tolerance, re-execution, scheduling, and accounting. SSIS on Dryad executes many instances of SQL server, each in a separate Dryad vertex, taking advantage of Dryad’s fault tolerance and scheduling. This system is currently deployed in a live production system as part of one of Microsoft’s AdCenter log processing pipelines. DryadLINQ generates Dryad computations from the LINQ Language-Integrated Query extensions to C#. 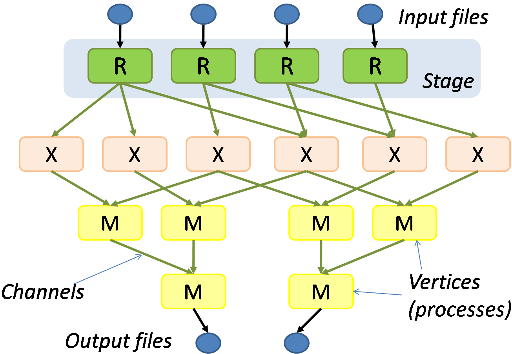 It allows processes to easily connect multiple file descriptors of each process — hence the 2-D aspect. It allows the construction of pipes spanning multiple machines, across a cluster. It virtualizes the pipelines, allowing the execution of pipelines with many more processes than available machines, by time-multiplexing processors and buffering results. Several languages are compiled to distributed shell processes. PSQL is an early version, recently replaced with Scope.